The Violin Sonata is a fine example of the highly impressive two-movement design that has fascinated Robert Simpson, where a vigorous Allegro is followed by an extended second movement which combines the function of slow movement, scherzo and finale in a continuous increase of activity whilst the pulse remains largely unaltered. Other notable examples of his works which adhere to this procedure are the Third Symphony (1962) and the Horn Quartet (1977). Both movements of the Violin Sonata are centred around G and are governed by the tensions released by interlocking major and minor thirds. Though not in strict sonata form, two distinct subjects are clearly identified in the opening Allegro: the first, announced on solo violin, a volatile flood of semiquavers, spanning a compass of the nearly three octaves. The second idea, heard shortly after, is a singing cantilena, introduced by piano and later joined by violin, where the interlocking thirds are particularly apparent. Much strenuous activity follows as both subjects are transformed into new ideas, and greater momentum is gained. But the ending is quiet — a strange 'double cadence' of G minor and G major, implying that the conflict is unresolved. The Variations that open the second movement are amongst the most evocative, lyrical music in all Simpson. The bars expand from two to three beats for the final variation (predominantly quiet, but with a gentle current) which leads almost unnoticed into the Ricercare. Major and minor thirds are still prevalent, though the mood is very tender, despite being rigorously contrapuntal in texture. The gradual increase in energy is sustained with effortless control until a fierce Presto is reached, in a manner that recalls the final fugue of the Ninth Quartet (1982). The dedicatees of the Violin Sonata are Pauline Lowbury and Christopher Green-Armytage, who gave the work its first performance in Wigmore Hall in February 1986. Simpson's Piano Trio, completed in January 1989, was commissioned by the Da Vinci Ensemble with funds provided by the Southern Arts Association. It has four movements in all, is played without a break, and lasts almost forty minutes. 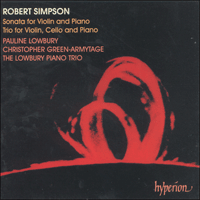 The London premiere of the work was given by The Lowbury Piano Trio in Wigmore Hall, London, in September 1993. Like so much of Simpson's later music, the Trio opens with a phrase that generates the course of the entire work: a simple, unaccompanied violin melody which explores ever-decreasing intervals within the span of the initial perfect fifth, G sharp - D sharp. As the composer himself once commented, '… the texture is mostly light and transparent, and often in four parts, like a quartet for the two stringed instruments, and the two hands of the pianist'. After a brief but turbulent climax featuring superimposed grinding dominant sevenths on the piano (a highly characteristic Simpson fingerprint which also occurs in the Violin Sonata), the tempo relaxes for a calm, evocative coda, where the violin and cello, sempre pianissimo, present a new transformation of the opening violin tune. The next movement is a Scherzo in fast duple time. Here the intervals gradually expand outwards from minor seconds to perfect fifths. Again the texture is light, though there are outbursts of sustained ferocity in the latter stages. The cello introduces the slow movement, Adagio: a set of increasingly elaborate variations on a very eloquent, simple melody, with gentle asides from the piano. Despite mounting activity, the dynamics are deliberately repressed until the penultimate variation (Più mosso), a vigorous confrontation between the piano and strings, whereas the last variation contains some of the most deeply contemplative music in the whole Trio. The piano launches the final, a fugue of great muscular strength which becomes less strictly contrapuntal as it progresses. After a final trenchant climax there is a mysterious coda; everything is dispersed into fragments (a device also chosen in the closing bars of the Eleventh Symphony), until the work finally cadences on C.
Undoubtedly one of Simpson's most uncompromising chamber works, the Piano Trio nonetheless displays the supreme powers of his compositional strength and integrity, and one of the most closely argued single spans in his oeuvre.